When something is this good, it must be shared. When it comes to choosing athletic footwear, there’s a lot to know. But first and foremost, just as you wouldn’t wear basketball high-tops to play a round of golf, your walkers aren’t meant for running, your runners aren’t for weight training, and your cross-trainers shouldn’t be your go-to shoe for grocery shopping. For the non-professional athlete who occasionally runs, cycles, and hits the gym, a single pair of “sneakers” is often used across all fitness routines. And for a young, agile person, that may be OK. But the older we get, the more it matters what we wear on our feet. Whether you're hopping on the spin bike, shaking your booty at Zumba, or doing laps on the track, your footwear should fit your activity and support you properly. A walking shoe like this can easily transition to suit your daily walks, errands, and extended travel, because of the supportive nature which stabilizes not only the foot and ankle, but the whole body. Running shoes are the most commonly mis-appropriated footwear, often worn by people seeking a “light, cushiony” alternative to their uncomfortable footwear routine. They’re called trainers because runners use them to train. I can’t tell you how many people I’ve come across who aren’t even using them for exercise. The design of a running shoe innately has less support than a walker or a regular shoe, because its sole purpose is to absorb the ground’s shock when performing high-impact activities, like jogging or running, and remain as lightweight as possible. When simply walking or working out at the gym, most running sneakers do not provide any lateral support (side to side), which ultimately puts your ankles and body at risk for injury and discomfort. Simply put: running shoes are for running and not much else. A cross-trainer is another great addition to your shoe collection to be worn when in a low-impact aerobics class or strength training. Often featuring a rigid, flat-bottom sole, cross trainers provide great lateral support for moving quickly from side to side and bearing weight. The reasons you wouldn’t want to go for a long walk or a run in cross trainers is simple. They are built with a much sturdier sole, lacking the additional cushioning which is used to absorb the shock from the ground. Therefore, your joints (ankles, knees, and hips, especially) will feel the major different if you go for a jog in a cross trainer. Start to love the gym. It’s tough to imagine changing your daily footwear routine if you’re used to throwing on a pair of Brooks and heading out the door. But we urge you: next time you do, please consider how those shoes will support you throughout your activity. Remember, not all sneakers are created equal. From the beach to the pool to your backyard BBQ, Naot Footwear will carry you with comfort and style no matter where your summer vacation takes you. This top-selling sandal is #1 for a reason. Pair the Kayla with your favorite sundress or comfy beach coverup to feel supported all day. The Kayla runs in full European sizes and true to size. Visit our showroom to find your perfect summer sandal today! Ok, so I admit, the title may be a bit deceiving. You may love to control things in your life, but one thing no one can control is the passing of time. Years go by and we get older, yielding a never-ending stream of fun new body and life changes. For example, as we get older, we aren’t as stable on our feet as we were say… at twenty. And that’s ok, so long as we don’t let our new posture keep us from staying active. A body in motion stays in motion. Can I get an “Amen?” Oh, you’re too busy clapping? OK. At The Shoe Fits, we genuinely try to encourage our customers to improve their wellbeing in every way; from activity to diet and nutrition, to of course, the shoes on their feet. So, often times, you’ll hear a resounding chorus or two of, “A body in motion stays in motion.” We really mean it and do everything in our power to get our customers in shoes that allow them to live life to the fullest. Why am I telling you this? I’m speaking directly to those of you who don’t feel like you can go for a walk on your own or head to the gym for an aerobics class or even take a weeklong Alaskan cruise. The very thing that will get you there and keep you standing is a well-fitting, premium pair of New Balance sneakers from their optimum control line of footwear. 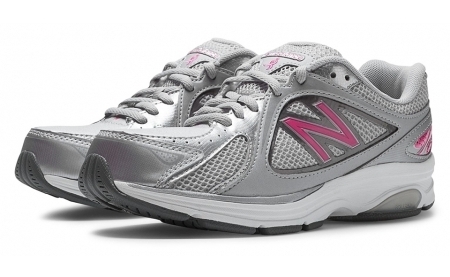 What distinguishes New Balance’s optimum control line from other workout shoes on the market? I'm so glad you asked. The construction of the sole, which is wider than normal, the combination of long lasting and absorbent materials, and lastly, the secret ingredient, Roll Bar technology, which provides incredible lateral stability throughout the foot and ankle areas. 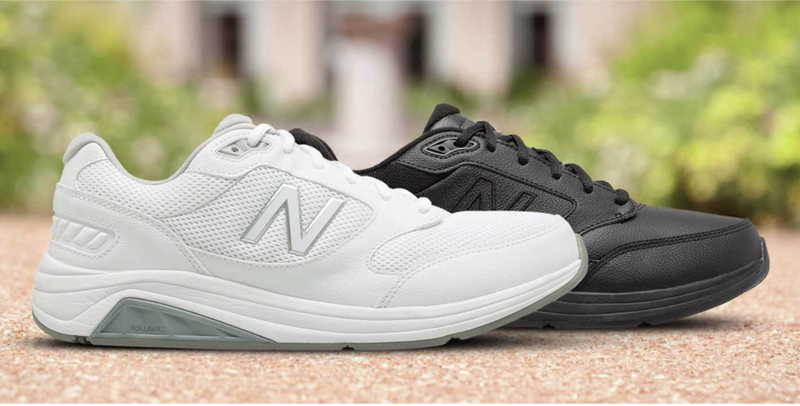 Additionally, our line of New Balance offers extended sizing from B width all the way up to 6E, with double depth in the toes for customers with bunions, hammer toes, and chronic swelling. You may not be able to control the hand life deals you, but you can take control of your health and fitness choices one step at a time. We’re here to help! Visit your local comfort shoe store to try a pair of New Balance today. Whether you’re on the job or around the house, finding comfort in more supportive footwear will provide lasting benefits and keep your feet – and joints – happy around the clock. If you love slipping into something cushiony, we recommend brands like Merrell, SAS, and New Balance that build extra special, shock absorbent components into the foot beds and soles of their shoes. 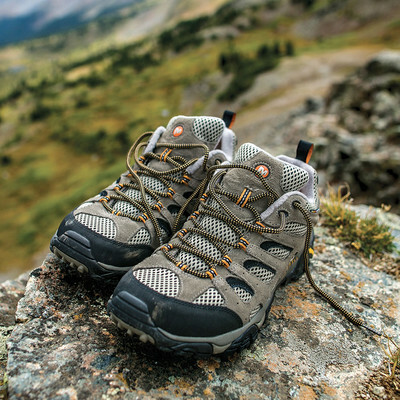 What distinguishes them from – dare I say – Sketchers, is the other components that make up the shoes: the subtle, built-in arch support; the soles that are built to last and molded to support your spine; the toe boxes with extra depth and width for your toes to wiggle and breathe; the materials that stand the test of time. Your shoes don’t just spare your feet from the grime and germs of the pavement when you’re out and about. Quality footwear provides a myriad of benefits to your posture, mobility, stability, and foot health. Until you step into a comfort shoe that isn’t made to fool you into thinking you’re comfortable, but is truly built to support your feet and body from the ground up, you probably won’t understand all the benefits I speak of. So, let’s peel back the illusion that Dr. Scholls and Aerosoles (gasp!) has convinced us is comfort and take a trip your whole body will enjoy. Disclaimer: For patients of diabetic neuropathy and other delicate conditions, cushioning may provide enormous relief. Find a footwear professional you can trust to discover the best pair of shoes for you. What makes a good shoe great? The answer is simple, but understanding it requires a deeper knowledge of what footwear does for our bodies. 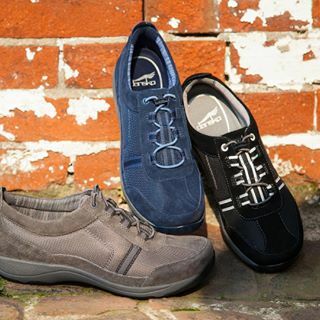 No matter how active you are, footwear is made to support your body throughout the day. Whether you’re up and down from your desk, traipsing around job sites, or rather sedentary, your footwear can cater to your body’s needs. It not only separates your bare feet from the ground you walk on, but can contribute a number of other benefits like proper body alignment, joint relief, and shock absorbency. It goes without saying that comfort is a major factor in the shoes we wear. Either they’re comfortable or they aren’t. While many wearers don’t make comfort the defining factor in choosing their shoes, they should. The comfort factor combines the proper fit, materials, style, and other components to ultimately provide a pleasant wearing experience. For some, comfort is defined by how supportive a shoe feels and the comprehensive effects throughout the body; whereas others seek lots of cushioning. Shopping tip: a happy medium is important. Your shoes do more than support your body. They offer function depending on the activity you’re engaging in. For example, if you’re wearing slippers indoors, you’d want them to keep your feet warm and provide traction. If you’re going to the gym and plan on doing the circuit, you want a shoe that provides lateral support for quick side to side motion and an absorbent sole that relieves shock from your joints. Choosing the right shoes means not only finding the right fit, but the style that caters to your life. Together, you and your shoes can be a winning combination. If you have shoes you love but they lack the comfort and support we’ve talked about, consider getting an iStep Analysis to learn about the orthotic options for you. The Aetrex Lynco line of ready-to-wear orthotics is a great, affordable option to make a good shoe great. Stop in to The Shoe Fits for your free iStep Analysis and learn how to better serve your feet today. Mention this blog and take $5 off your first Lynco purchase. The shoes you wear to work matter. Why? Just like you would want the best tools, office supplies, or machinery to do your job, your shoes are a big part of the job you do. Whether you sit, stand, walk, run, or pace the floors every day, your shoes could be bearing the brunt of the pressure (literally). A good work shoe starts with quality materials that stand the test of time (and job site), and end with a perfect fit that supports your feet and body comfortably. If you’re thinking that this sounds great, but you doubt there are shoes for your industry that are appropriate and comfortable, think again. With the proper education about your feet and the job you do, an educated salesperson can help you find a shoe that meets your job’s specifications. Consider work shoes an investment that pays itself off the first day you come home with pain-free feet. The proof is in the pudding. Try a pair of our featured work styles today. The truth about your feet as an adult. You probably remember going to buy shoes as a child. Your parents took you down to Stride Rite or Craft Shoes and had you “fit” into a pair of shoes for the upcoming school year. The kind man would use the metal device to measure your feet and carefully find you a pair of shoes that would “last you” until you grew out of them. Chances are, they were practical and basic with laces to accommodate growth throughout the year. Now, you’re an adult; you may be thinking that your feet have stopped growing. You don’t need to replace your shoes every year or have someone “fit” you. You know your size. Right? …Wrong. The truth about our feet is that they continually change as time goes on. They grow, flatten, take new shapes, and need annual fitting, just as regular as your medical check-ups. If you don’t think the size of your shoes relative to your feet is important, wear a pair of shoes that’s a half size too small for a couple of hours. It’s not fun. You’d quickly find that your toes are squished, arch isn’t lining up, blisters are forming, and more unpleasant things are happening, all because of improperly sized footwear. Aside from discomfort, wearing shoes that are the wrong size defeats the purpose of shoes altogether! A shoe is built to support your body in its natural stance, following the curves in your foot and supporting you from head to toe. If your feet are not laying naturally in a shoe, they can't possibly be supporting your body properly. The way your foot uniquely sits in a shoe will change as time goes on because of the natural evolution of our bodies, movement of our bones, changes in weight, and many other factors. In fact, if you’ve been wearing shoes that are too big or too small for long enough, that can have a significant impact on your foot health and size going forward. As shoe sellers, we saw a major decline in our customers’ foot health and a major increase in the spreading and width of their feet after the popularity of Crocs. Men and women alike clung to their Crocs because they “felt like slippers” or “were so easy to throw on and off.” We’ve heard it all, really. But as we observed our customers and probed them about their shoe habits, we found that customers who relied on Crocs as a go-to shoe were experiencing more spreading and an increase in width size. Their feet felt fine in Crocs, but awful in their other shoes. To be honest, we even sold Crocs until we saw the negative impact they were having on our customers' feet. We, too, fell blind to the easy comfort at first. Any reputable source who knows a thing or two about feet will be able to evaluate your feet based on three measurements taken – toe length, arch length, and width – and recommend size and styles that will work best for you. As we saw with the Crocs generation, shoes that are too large are just as – if not more – dangerous than shoes that are too small, because they lack lateral support (side to side) and allow your feet to slide around with no real boundaries. #1: No matter how normal you are, your feet change and need to be fit by a professional. #2: Every brand cuts their shoes differently. Size is just a number that will change from style to style, so it’s most important that you try shoes on prior to purchasing them AND don't be attached to a size or number. #3: Don’t compromise fit and comfort for style. Wearing shoes that aren’t your size is detrimental to your feet and body. When your shoes fit better, your face will reflect that comfort and your body will thank you. Let me start by saying… I know. I know you cringe at your grandmother’s Velcro walking shoes and pray that you’ll never be in shiny, ventilated, “practical” footwear. You hope there will never be a day your dainty little feet will become misshapen and outgrow your favorite blue suede pumps. You’re really hoping you can keep throwing on $2 flip-flops from the big box store and running out to get groceries without a care. I’ll stop you right there – right at easy-breezy $2 flip-flips in every color. What you may not realize is that even though you aren’t bound to special shoes by some medical or physical necessity, you’re expediting the process with ½” of foam and a plastic, made-in-China toe strap supporting your every step. Allow me to introduce myself. I’m 25 years old and I’ve been wearing comfort footwear for 7 years. No, I didn’t have to. Yes, I choose to. Why? Why would I give away the best shoe years of my life to cork footbeds and adjustable straps? It’s simple. Comfort doesn’t have to be a compromise. The truth is, the place you’ll feel the most compromise is your wallet. But just for a minute, because as soon as you grab your keys and head out the door in your new, perfectly-fitting, memory foam-soled shoes, you’ll forget all about the cost differential and realize you invested in more than something to separate your bare feet from the concrete. You’ve given new life to your joints, aided your body’s alignment, and guaranteed a great new addition to your wardrobe for years to come. That’s right… years! Spending a little more – and not on the “name” but the quality – means getting more time out of your favorite shoes. Trust me, no one likes to part with supple, softened leather molded right to the sole of their foot. As I was saying, comfort doesn’t have to be a compromise. Let’s take NAOT for example – a longstanding manufacturer of quality, comfort footwear, specializing in moldable cork footbeds and the softest leathers. NAOT is also known for fun, new finishes to their leather uppers, which make every season more interesting. The difference between the ½” that separates your bare feet from the concrete in a NAOT is years of developed technology which yielded support, style, and long-lasting materials. This is just the tip of the iceberg with what’s available in comfort footwear today. But rather than overwhelm you with options you’ll be running to us for, (<insert wink face>) here’s our Shoe of the Week! Perfect for errands, summer occasions, and everything in between. Quick & Dirty Reasons to try this Shoe of the Week. #1 Firm, yet forgiving support throughout entire footbed using memory foam layered on top of a stiff outsole. #2 Slight heel for style and posture – works to accent a super casual outfit. #3 Quality leather, adjustable straps are thick and will withstand the test of time. As the third generation offspring of a shoe repair technician turned comfort-shoe-aficionado, I've taken a liking to helping others walk through life – better, easier, healthier. After my own life-changing experience upgrading from bargain shop shoes to orthopedically-approved footwear, I no longer believe living in pain should be an option. If there's a solution – whether it's a new pair of shoes, a doctor referral, or a dictation on why your shoes matter – I want to help you find it. 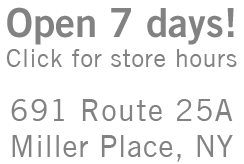 At The Shoe Fits, we take responsibility for educating our customers and others we meet on the importance of all things foot- and shoe-related. We hope you'll feel at home, learn something new, chuckle, and come in to see us at our Miller Place, NY location real soon. Happy walking! Sign up with your email address to be the first to read the latest from The Shoe Fits Shoe Blog.